Hail Brood II: Magicicada spp. In May, cicada nymphs will appear by the handful in areas being treated to Brood II. Nine years ago, states bordering the Mississippi and those eastward were treated to trillions of red-eyed insects known as Brood X periodical cicadas. Like some strange biological equivalent of Haley’s comet, these boisterous bugs were touted as a phenomenon that occurred only once every seventeen years. This was a source of despair for those who loved them and a source of relief for those who didn’t. Part of the story not known to all, was that in other parts of the country other broods of cicadas are found in intervening years. In fact, there are 12 broods of 17 year cicadas and three broods of 13 year cicadas! So it is with delight that we welcome Brood II to the east coast this year. After seventeen years sucking sap from roots of trees underground, cicada nymphs are getting ready to emerge from northern North Carolina to the Hudson Valley in central New York. In the path of this biological deluge are major metropolitan areas and their suburbs including Hartford, New Haven, New York City, Philadelphia, and Washington, DC. One report has it that periodical cicadas may even be seen in Central Park, NY. One of the most precarious acts for the cicada is shedding the exoskeleton it wore as a nymph. The life of a cicada is mysterious and precarious. After consuming xylem fluid from the roots of plants underground and completing their juvenile life as nymphs, each cicada constructs an escape tunnel to the surface of the earth. Soil temperatures in the middle sixties are the cue that the world above ground is warm enough to support flight and reproduction. Many nymphs emerge at night and make a mad dash for vertical structures such as trees and shrubs. However, lampposts, street signs, and slowly moving people seem to work just as well. After climbing up and away from the soil, they attach to a firm object to begin the process of molting. Their outer skin, or exoskeleton, splits along a predetermined line on their back and the beautiful adult cicada wiggles free from the shell. The freshly molted adult is almost pure white except for bright red eyes and patches of black behind the head. Before its skin hardens, the cicada must expand its wings or it will be unable to fly and seek a mate. After wings and legs have hardened, cicadas scurry or fly to the treetops. Males vibrate the tymbal to produce a variety of calls. 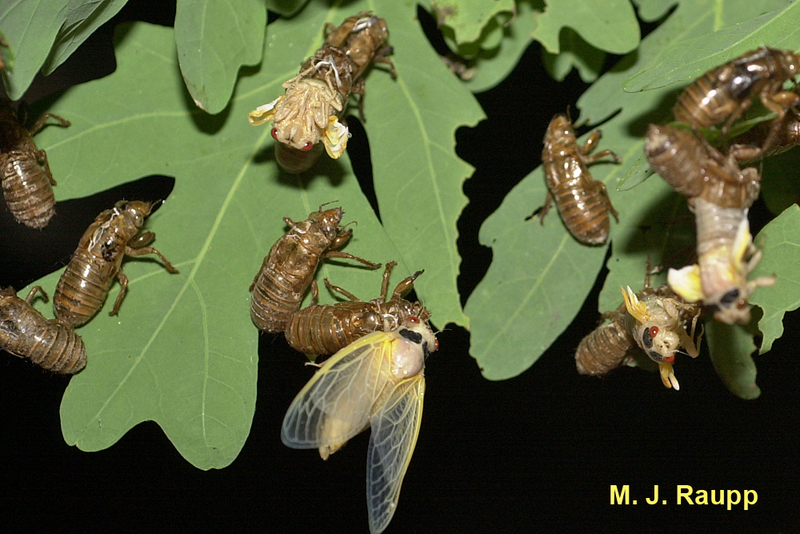 Emergence from the earth and the final molt are perilous times for cicadas. Many cicadas survive interment underground for seventeen years only to perish attempting to molt or reach the safety of the trees. The big noise in the treetops, the hallmark of periodical cicadas, is all about love, baby, yeah. 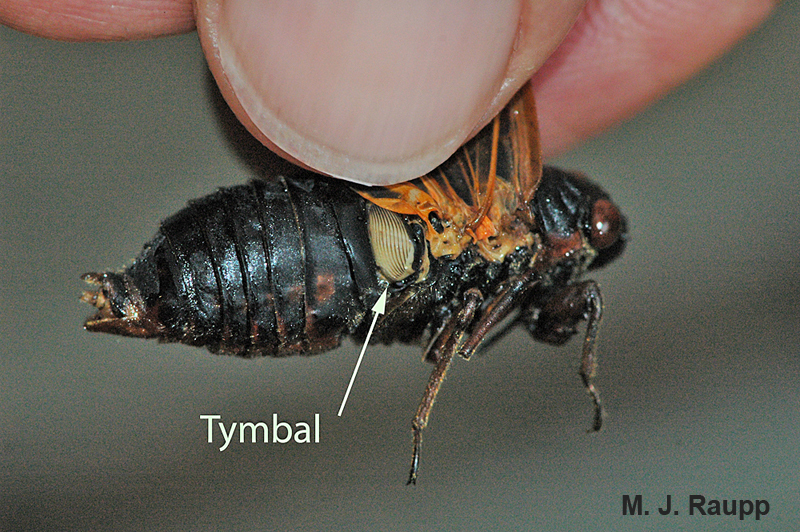 Male cicadas have evolved a unique structure called a tymbal. These paired organs are located on the sides of their bodies just beneath the wings. Through muscular contractions, males vibrate the tymbal much like a drumhead to produce sound. Males produce a variety of calls for different purposes. If threatened by a predator such as a bird or a squirrel, a loud squawking noise is made in attempt to startle the predator and make an escape. The principal function of the tymbal is to produce calls that assist in finding a mate and winning her affection. One type of call attracts both males and females to a common assembly place, such as a large tree. When guys and gals get eye to eye, the male will use three distinct and different courtship songs to try and convince the gal that he should be the father of her nymphs. If the lady likes his advances, she will signal her approval by flicking her wings with an audible click. After mating, the female cicada moves to tender young branches to lay eggs. Using a saber-like structure on her abdomen called an ovipositor, the female gouges groves into the woody tissue and lays 20 to 30 eggs in an egg nest. This process is repeated on one or more plants, and a female may lay as many as 600 eggs total. After incubating for more than a month, the eggs hatch and tiny nymphs a few millimeters long dive to the earth beneath the tree. In a matter of minutes, they burrow into the soil, find roots, and insert a small straw-like proboscis into the roots. Cicada nymphs hunker down underground sipping sap and slowly growing larger. Despite what you might have heard, cicadas are not blind. Their red eyes see fine. They do not bite, although, if very thirsty, one may probe you a bit with its tiny beak in search of moisture. Periodical cicadas are not one species. Broods of 17 year cicadas are comprised of three distinct species and 13 year brood contains at least four. Many mysteries remain concerning their evolution, distribution, and synchronous appearance. Without a doubt, they are a true marvel of nature and one that should be enjoyed whenever possible. We will explore these mysteries in future episodes of Bug of the Week. Escaping from a subterranean crypt appears to be a struggle for this nymph.